Industrial wet painting is the traditional method of protecting and aesthetically enhancing components, structures and fabrications. Materials that are treated by a wet paint process include steel, aluminum, and iron, along with plastics. AllSpec Finishing's wet paint services have proven effective and with consistent high-quality results. Utilizing enamel, two-part epoxy paints and polyurethane or multicomponent finishes, AllSpec Finishing typically executes a process based on standard specification or proprietary customer specifications. Why choose AllSpec Finishing for your wet painting needs? We maintain strict adherence to your standards and specifications. We have the industry experience to make recommendations to your team throughout the process. Our wet painting booth's can accomodate large items. Our state-of-the-art dual batch drying ovens speed up project delivery time. E.M.I & R.F.I. 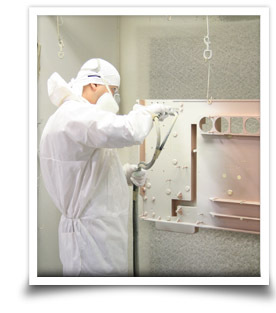 Shielding: Provides for electrical conductivity or shielding on non-metallic parts. AllSpec Finishing can also apply corrosion and anti-skid paints for various aerospace and marine applications. From dielectric to wet painting parts of different configurations, AllSpec Finishings' proven process-control inspections ensure the high level of quality to consistently deliver on their wet painting process. Proven process-control inspections ensure the high level of quality AllSpec Finishing consistently delivers on their wet painting process. Click here to get a free, no obligation online quote from All Spec Finishing.